You met Sunshine. Nakota came as a gift when we had to euthanize Sunny. She was by a local Quarter Horse stallion named Red. Her owners thought enough of her that when the time came for me to move on to another horse, she was to be returned. And oh, she might be pregnant. Isn't that how it goes? Free horses always come with something extra. And in this case, it really was a something extra! Nakota was somewhere around three years old when she came to me. She wasn't broke to ride, but there was no hurry-bone in that mare. I lunged her a few times, carefully placed a saddle on her back, and tied the leadrope to the halter to make a set of reins. And I just rode her. I didn't know that un-broke horses could buck like the devil. She didn't, and before long, we were trail riding all over the dirt roads of the mountains behind our house or ambling along the Eel River. Do you see the cat curled up on Nakota's back? Little by little Nakota's belly got bigger and bigger. I kept asking around if anyone thought she really might be pregnant. No one knew, and no one thought to call the vet. She either was or she wasn't. Early one morning we found out that she was. My corral was up a little trail above the house. My dad's property is covered with dense brush and trees and if not removed, it gets pretty thick. You couldn't see the horse fencing from the house down below. I ran up and down the trail at least a million times each day. It was a well-worn footpath by the time I went to college. Each morning at dawn I would throw on rubber boots if it was raining, or just go barefoot if it wasn't. I zipped up the trail to throw hay and fill the water trough. On school days, I would hurry back home and climb back into bed for a few minutes. On weekends or during the summer, I would hang around and groom or just visit. I know it was a morning in March 1987, but I am not sure if it was a school day or not. Just like every other morning I ran up the trail, grabbed Nakota's flake of hay and tossed it into her corral. Right away I knew something was wrong. She was agitated and pacing the fence line, not her normal routine. I looked around in the pre-dawn light and noticed that her robust belly was gone and each rib was standing out. I also noticed a goopy mess on the ground that I quickly realized must be an afterbirth. I looked around for a foal and was dismayed that there didn't appear to be one. Where could it have gone? I clearly wasn't able to solve the problem, but Nakota seemed determined to try. I threw open the gate and watched her plunge over the side of the steep, brush covered hill. I whipped around the way I'd come, and rather than follow her through the brush, I ran to get my dad. I am pretty sure he heard me yelling from all the way up the hill because it took him about ten seconds to get up and fire up his motorcycle. I should pause here and talk about that motorcycle. All of my horses were very comfortable with the roar of the bike as it was the way my dad zipped up and down into town and around the property. On hot days, cold days, and especially on lazy days I would beg for a ride up to the horses so that I didn't have to walk. I had been riding on the back of my dad's bikes since I was so small that my arms didn't even wrap all the way around his waist! So when I heard the bike fire up, I was on the back in seconds directing my dad down the hill over which Nakota had charged. I was hoping to intercept her before she went any farther down. We looked for her for quite a while, but she was nowhere to be found. Now I was missing a foal AND a mare. I was near tears and my Dad, bless his heart, couldn't figure out quite what was so upsetting. I think he may have said something like we'll find 'em, as though they were obviously close by. We were in the middle of the Pacific Coast Range and the nearest highway was some miles away. Of course he was right. She was close. I don't know if it was my Dad, or me, who decided that I should go by foot, but that's what happened. I started climbing the hill from the bottom, and my Dad drove the bike back up to the corral to see if she had come back. I climbed the hill, ducking under branches and crashing through thick underbrush, keeping my eyes peeled for Nakota's red coat. And near the top, I caught the flick of a tail swatting at a fly. I approached cautiously, not at all sure of what I'd find. When I got close, I gasped in dismay. Nakota was standing over her foal, who was caught in a tangled mess of branches and bushes. His slender little legs were crooked and bent at awkward angles, and I wasn't even sure he was alive. I reached out and touched her hip gently. She nickered, but let me get closer. I knew I couldn't move him byself so I started shouting to my dad that I'd found them. I was never so relieved to see my Dad's outline as when I saw him emerge through the brush. I pushed Nakota back, and my Dad gently reached under the foal and untangled his little legs. I remember seeing his heart beating through his little ribcage as my dad carried him in his arms up that steep hillside. I don't remember a halter, but Nakota followed along politely. I do remember thinking that Nakota knew we were helping. She stayed behind me as we followed my dad, but she did keep her eyes on her baby. 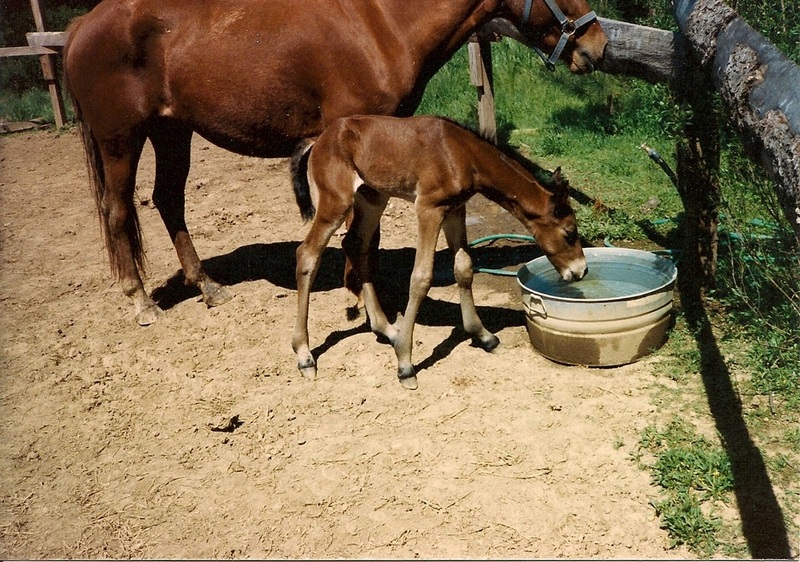 Dad carried the foal into the corral and set him down carefully. Nakota needed no encouragement to enter. She barged though the gate, eager to check out her baby. We closed the gate, and watched a foal try to rise for the second time. It took him a while to get on his feet and stay there, and once up, he did the same thing that all newborn foals do. He suckled at his momma's armpits, legs, belly and finally found her teats. After his escape, Nakota kept herself between her foal and the fence. There was no way she was losing him a second time! Once everyone was safe, my dad and I took a look around. We think that Nakota laid down close to the fence and delivered her baby. When he eventually got up, he was on the wrong side. In his confusion, he must have headed the wrong way, and probably fell down the steep side of the hill. Once he was buried amongst the branches, there was no way for him to rise. In the end, he grew up to be a very sturdy fellow who followed us around like a puppy dog. He had no fear of ropes, loud noises, or motorcycles! 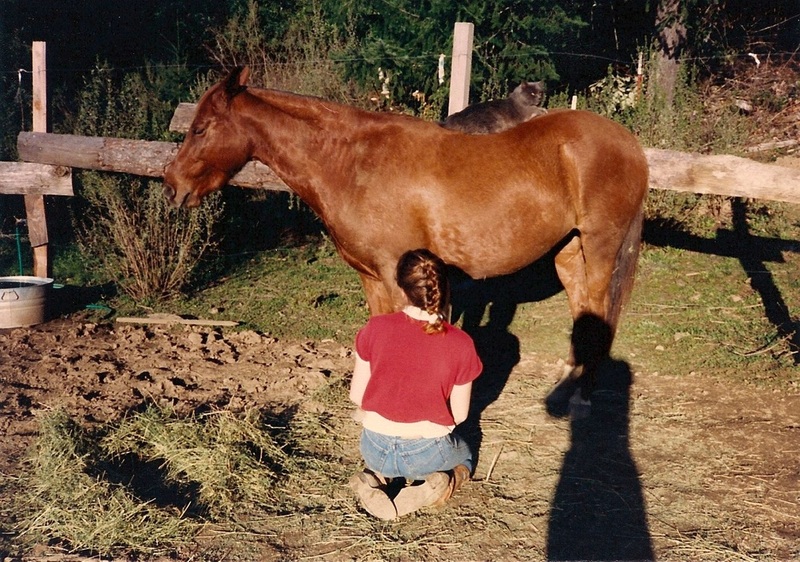 I eventually needed a more forward horse than Nakota, and as promised, I gave her back. 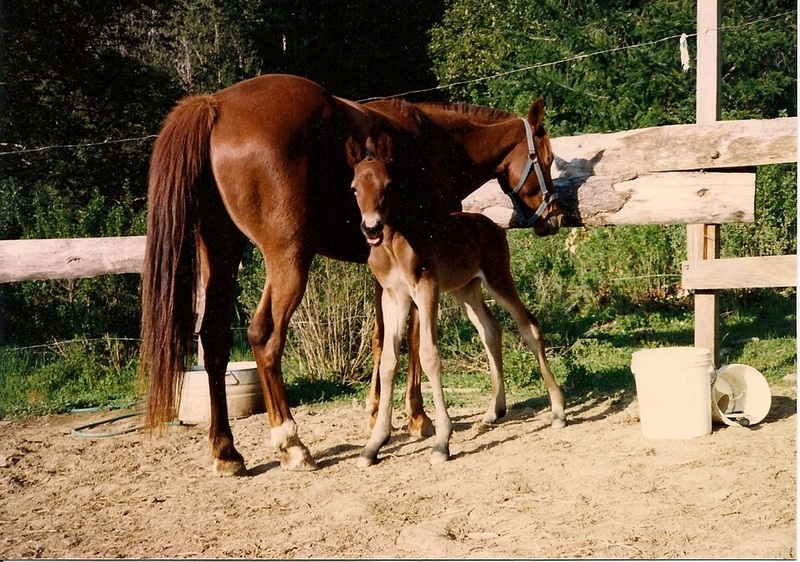 Since I had raised the foal, he was mine to keep and do with as I wanted. I named him Gideon after the young man from the book of Hebrews. One of its meaning is mighty warrior. When Gideon was two, I left home for a study abroad. I sold him for $200 to a man that I knew to be good with horses. As with Sunny, Nakota and Gideon each taught me many lessons. Nakota let me learn about "breaking" horses in the gentlest way possible, while her son taught me something about the miracle of life. Both were special teachers.